May buy 4 for yourself and 4 additional as gifts. May redeem 1 per visit. Classes are available starting after purchase. Online reservations required and subject to availability. Must arrive 15-minutes prior to class time. Not valid for events at restaurants, Paint-By-Numbers events, or kids' workshops. Food and beverages are available for purchase. Expires 3 months after purchase. See the terms that apply to all deals. 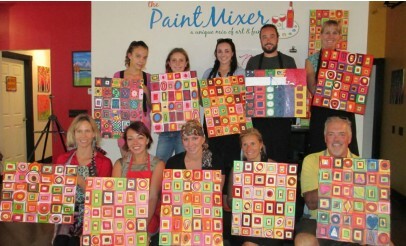 The Paint Mixer invites guests to unleash their inner artist and create a masterpiece. During two-hour sessions, guests are treated to step-by-step instruction, great music, and an entertaining atmosphere, which creates the perfect setting for all ages and special events. These events require no prior experience or artistic ability. All materials need for each class are provided; including canvas, paints, aprons, and brushes. Guests may purchase light snacks and beverages such as featured wine, beer, mimosas, champagne, and non-alcoholic beverages. Enjoy a night of art and fun at The Paint Mixer. All ages are welcome and no prior artistic experience or ability are required. The Paint Mixer offers on-site events at their Park City and Sugar House studios and they also have off-site events. You can visit their website or call to learn more about these on-site and off-site events.